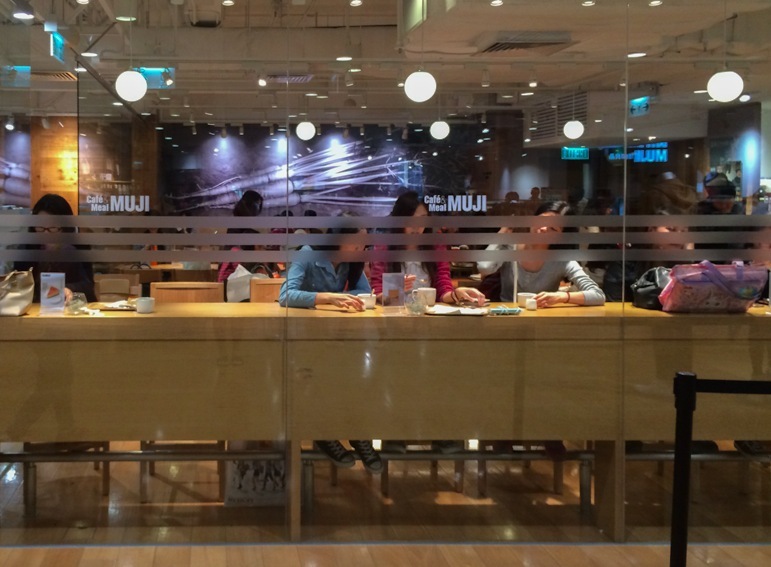 To me, Muji is a great brand – and I love that the shops here in Hong Kong are different than those in the UK and Germany. 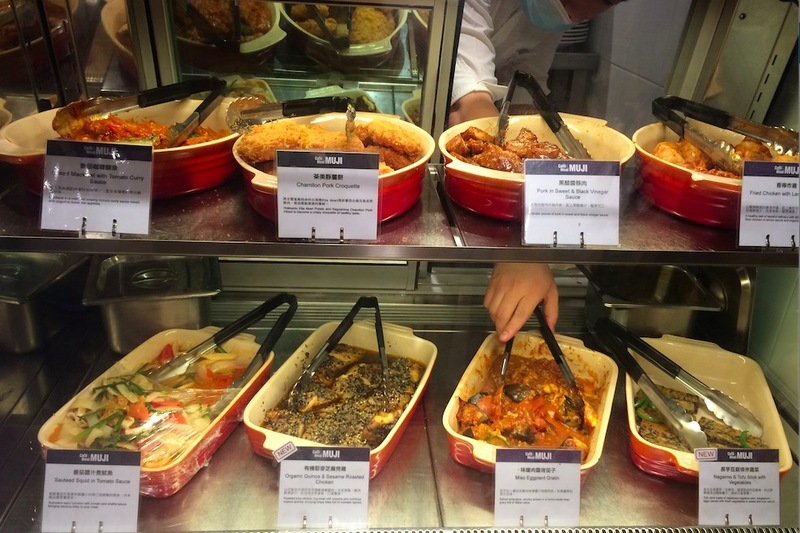 They also sell food items (mainly baked goods, but also snacks, tea, instant soup and drinks) and they even have a cafe in their Lee Theatre shop. I believe that’s the only one in Hong Kong right now, but correct me if I’m wrong. 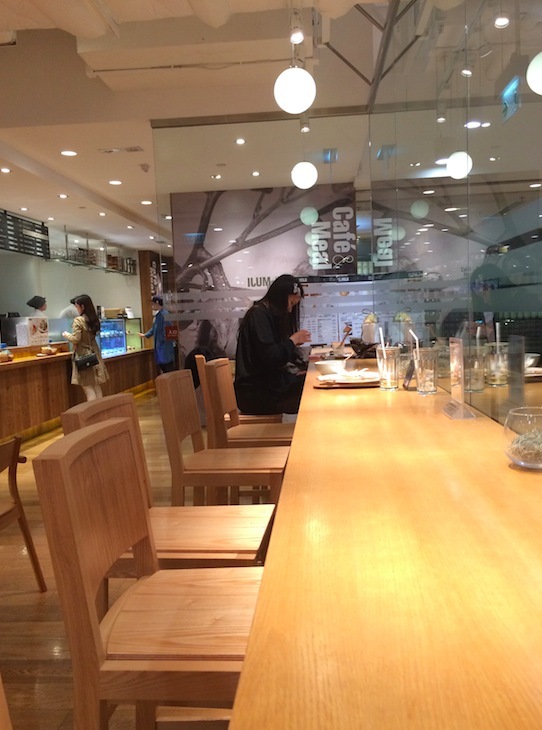 It’s not a proper cafe, it actually is a self-service canteen with a few dishes. 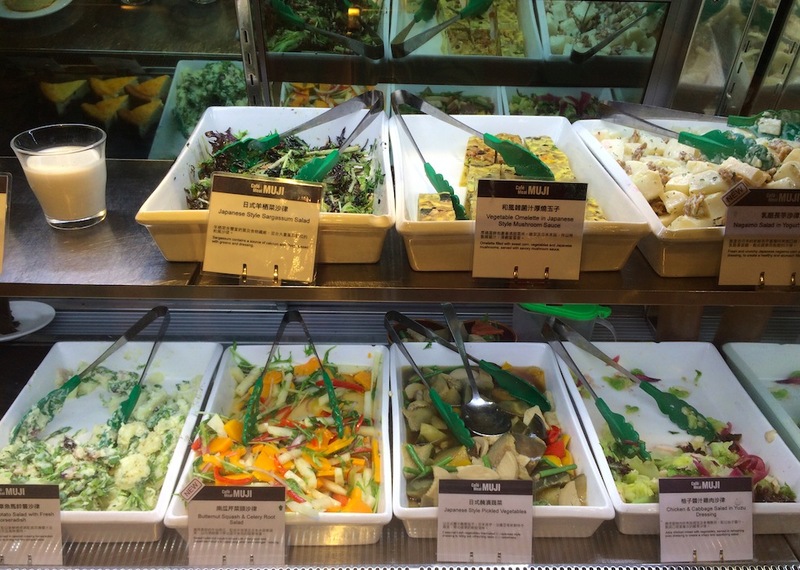 You can choose between a few cold and hot dishes, desserts as well as cakes, coffee and tea. The meal comes in either a three dish set (88 HKD) or a four dish set (98 HKD). The sets come with a drink of your choice and rice. 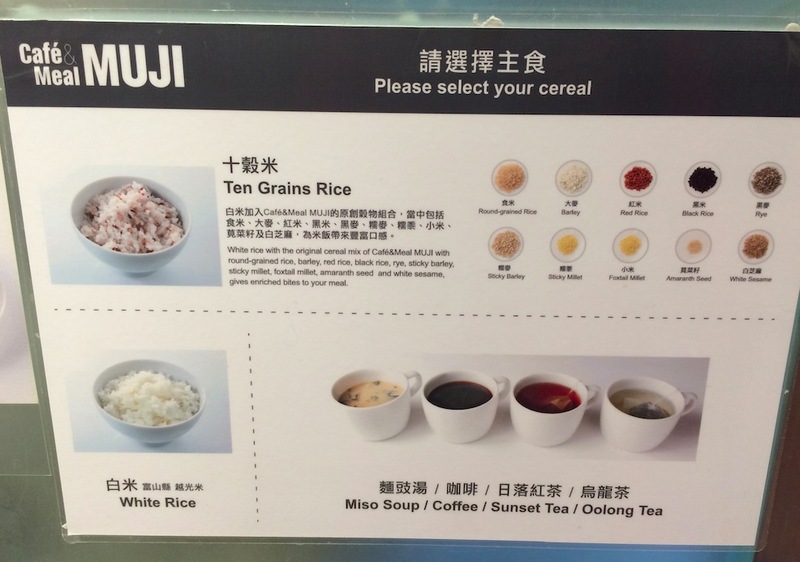 For the rice you get to choose between white rice and ten-grain rice. For the dishes, you get to choose two hot and two cold dishes for the HKD98 set and one hot and two cold for the HKD88 set. Desserts are around HKD40 and include puddings, flan and ice-cream. There are about 8-10 hot and 8-10 cold dishes every day. I don’t know how often the menu changes – I’ve been twice in the same month and found the menu to be roughly the same. 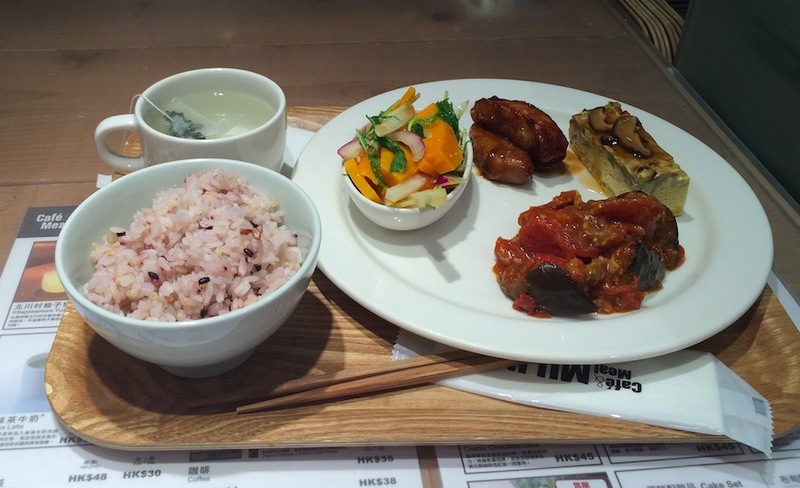 But on the Muji website it says ‘Based on the concept to pursue natural flavour of the food Cafe&Meal MUJI makes use of seasonal ingredients‘ so I guess the menu changes regularly. So pictured above you see a four dish set: sweet and sour pork (hot), eggplant stew (hot), vegetable omelette (cold) and a pumpkin salad (cold). 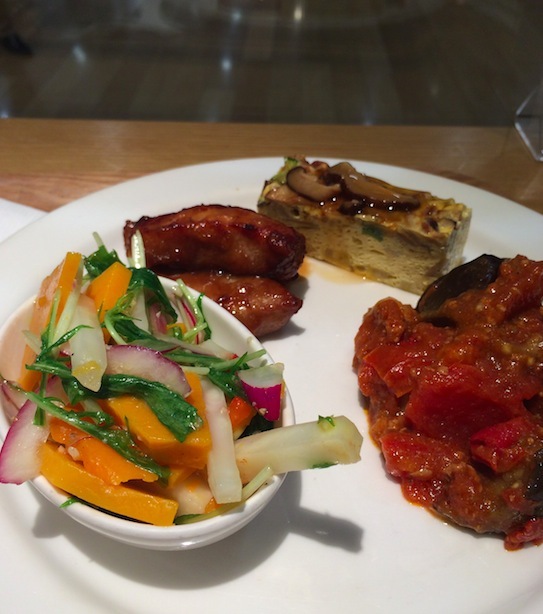 The dishes are quite simple, but not bland. They seem to be quite healthy, without much oil, fat, sugar or salt. I did enjoy them. Would I go there again? Yes and no. I am a bit torn. The price is quite steep (98 HKD) for the portions sizes – and I hated the fact that my plate was cold and the cold dishes were very cold. There should be an option to heat up your plate and dishes, maybe they could have put a microwave somewhere (or is this too much IKEA-style?). Also, why limit to one or two hot dishes, maybe someone would like to have four hot dishes in one go? I know – that’s something they should roll out in other markets too! 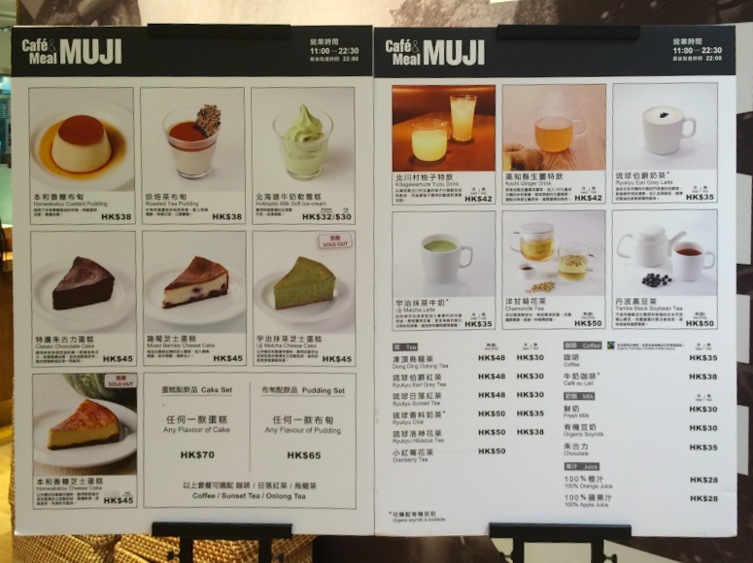 They have some amazing green tea baumkuchen cake that I always purchase at HK airport to take back to Europe, and then no one can believe me that this is actually from Muji, the store that is known for its clothes, stationary etc. !